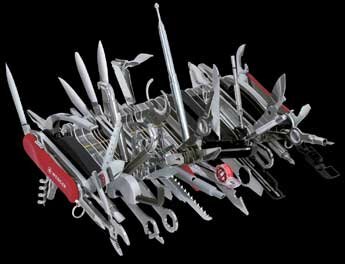 Wenger, the maker of the Genuine Swiss Army Knife, has outdone itself with the "Most Incredible Knife" (MIK). Sure, 18 tools is okay, but 85 tools is better. At $1200, the MIK costs $14.12 per tool. Sure, that's a little more than the $5.56 for the 18-tool knife and the MIK does weigh in at nearly three pounds, but there will NEVER be a problem you can't fix. Place your order today! I Got In Trouble With Microsoft...and Lived! Ooooo...busted! I posted some cool Xbox 360 accessory news last week. Because the news was so strange and felt to me to be merely conceptual, and because no one (and I mean NO ONE) reads this blog, I thought it was okay to post. I guess it was more confidential than I thought because I got a call to take down the post. I feel a little dirty, but also a little pleased that for a mere second, I had a scoop. My apologies to my source for any trouble I may have caused. It was certainly not my intention. That said, keep an eye on the Xbox 360 in the months to come as some cool stuff may be making an appearance! Pitfall! is my all-time fave for the Atari 2600. 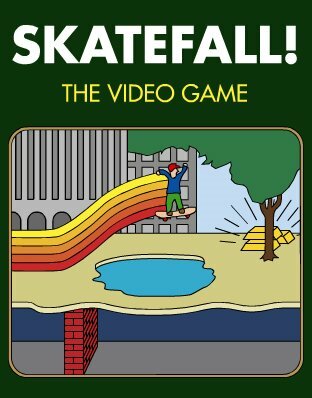 A clever gentleman, John Freeborn, has created an updated version of that classic: SKATEFALL! This might just be the coolest Flash game yet. I enjoy the saying the words "pants" and "poop," but never in the same sentence. I enjoy all aspects of food. Television is the greatest invention ever. Period.